Hey fellow scrappers.... I managed to complete this card after work today. I liked how it turned out but i have to tell you i had trouble cutting her out. I'll have to leave a halo around her next time. Her pour wrist is very weak....Hope you enjoy. 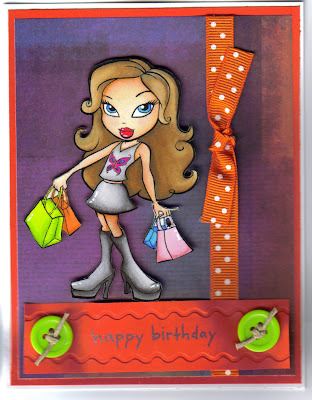 Sorry about the shadows but i had to scan this card as i have no daylight left..
http://theshabbytearoom.blogspot.com/ : use buttons and or bows. Fabulous card! I found you on the Canadian Crafty blog hop! Another great card!! You are amazing!! Super cute image! Thanks for joining us in the Tea Room this week!